For an impromptu family dinner celebrating two of three of Bill and Beth C's son's being home for a weekend/evening, we were honored to join in the special festive occasion. 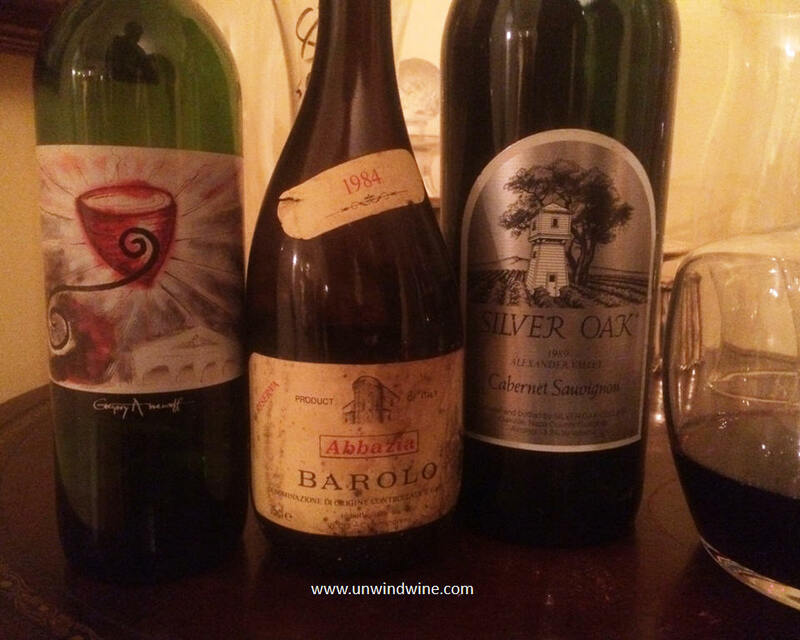 Beth was preparing lasagna so Bill and I chose some hearty wines that also happened to represent the boy's birthyears. Bill pulled out a magnum of 1989 Silver Oak Alexander Valley. I had contributed earlier a 1984 vintage Barolo picked up on a trip to Europe, waiting for a suitable occasion to feature that vintage. Ironically, I also brought another 1989 vintage wine, this from Benziger Family winery in Sonoma, ironic since Bill had already opened a bottle of Benziger for predinner tasting. Served from a magnum, this was medium bodied with dark blackish purple color. Bill's notes from Cellartracker, "Plenty of fruit left in this but not much backbone. Was pleasantly surprised that this was still in OK shape. Medium purple color showed no signs of age. Took about an hour after decanting for the nose to reveal perfume and floral notes. Reminiscent of cherry and raspberry on the palate with a touch of oak but the tannins are gone, making this a bit thin." 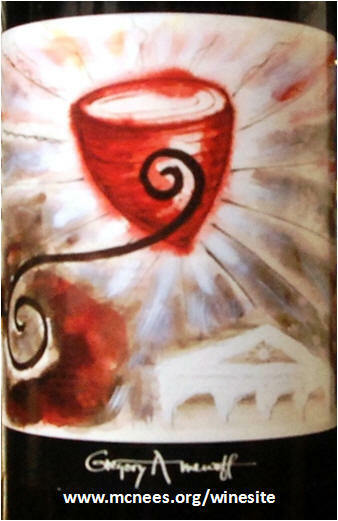 There are several wines producers that offer artist label series, wines with a different label each vintage featuring original artwork from an artist, or more typically, each vintage featuring a different artist's work of art adorning the label. The most famous of these of course is Chateau Mouton Rothshild, one of the world's most noted wines. Their labels feature original artwork by world class artists produced specifically to adorn their signature vintage of Mouton Rothschild first growth Bordeaux. They are so distinctive that even empty or past drinking window bottles become collector's items in their own right. I've had fun over the years collecting or seeking out each vintage of Mouton's and have an image library of their famous line of labels in my wine Mouton wine label library on unwindwine.com. This is not an attempt to compare Benziger wine to Mouton Rothschild in any sense other than the concept of an artist series of wine labels. In the case of Benziger, their Imagery Series is an artist series of wines that feature artwork by a named artist adorning the label. Benziger then feature a special bottling of wine from a named grower and featured winemaker (s) with each bottle of the limited bottling is individually numbered. 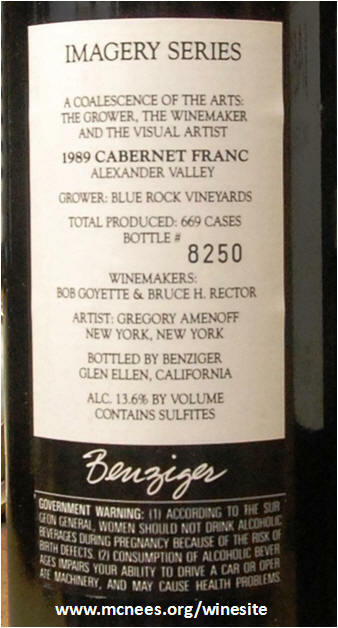 This bottling features 1989 Alexander Valley Cabernet Franc from Blue Rock Vineyards, and was crafted by Benziger winemakers and friends Bob Goyette and Bruce Rector. The Imagery Series was created to offset Benziger's wines produced from their Glen Ellen estate with lot of specially crafted wines from boutique or varied producers who might otherwise sell their wines to be private labeled or blended into other larger production wines. At twenty-five years of age, it was time to open this wine, on this occasion, it was serendipitously a birthyear tribute to Matt and Molly who were with home for the weekend and joining us for dinner for a gala family dinner. Medium bodied with garnet rust color, this opened initially a bit lean and astringent but over the course of the evening revealed more and more black cherry fruit accented by spice, cigar box and hint of earthy leather on the finish. How ironic that I pulled this Benziger Family bottle from the cellar for Beth's lasagna dinner to find Bill had opened and was serving a Benziger Family selection for before dinner. We visited the Benziger Family estate in Sonoma Valley Bill and Beth C during our Sonoma Valley Wine Experience back in 2008. 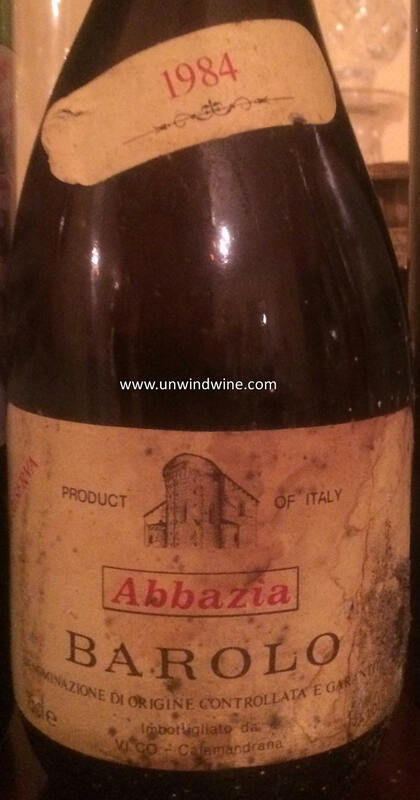 I had this 1989 vintage bottle in the cellar having purchased it at auction over the years. So it was fitting to bring a Benziger 89 for a family dinner with 89 birthyear son Matt visiting from out of state. 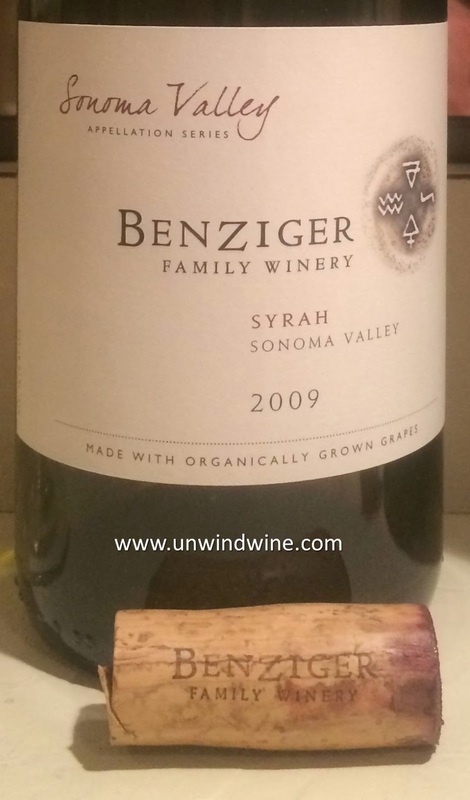 Bill had already opened this and was serving it when we arrived so it was serendipitous that I brought another Benziger, notable in that we visited the estate together during our Benziger Family Winery - Sonoma Valley Visit in the Autumn '09. This really opened with time and in many ways was the surprise of the evening by virtue of its improvement and value. Some white pepper became evident on the palate. The nose became highly floral and the fruit blossomed. Nice bottle of wine. ce but it was lacking. Will see if this opens with another hour or so. I found it dark purple colored, medium bodied, a bit lean with a moderate black berry fruit accented by tones of white pepper with hints of spice. I purchased this bottle in a little neighborhood wine shop in London near Oxford Street and Ware Road back in the late 1980's. It had been lying down in our cellar for over two decades. With my penchant for having wines for special occasions and having kids born in three different years in the first half of the 80's decade, I presumed we'd have one of their friends from this vintage year to toast at some point. With our wine collecting and tasting with dear friends the Connolly's becoming increasingly commonplace over the ensuing years, it was only fitting to bequeath this bottle to them as its the birthyear of their middle son, Drew. It was only a matter of time we'd likley end up drinking it for some occasion. With the bottle aging it was due and Bill pulled it when tonight's family dinner came together with Drew and Matt being in town from Tennessee. While this was lean and a bit austere, it had more life in it than I expected. Garnet colored, medium bodied, the nose was muted but after an hour or so the black cherry and cherry flavors emerged and predominated over a layer of leather, dry earth and hints of minty anise on a rather tight finish.